IGG’s Mobile Royale combines kingdom building with real-time strategy gameplay elements. 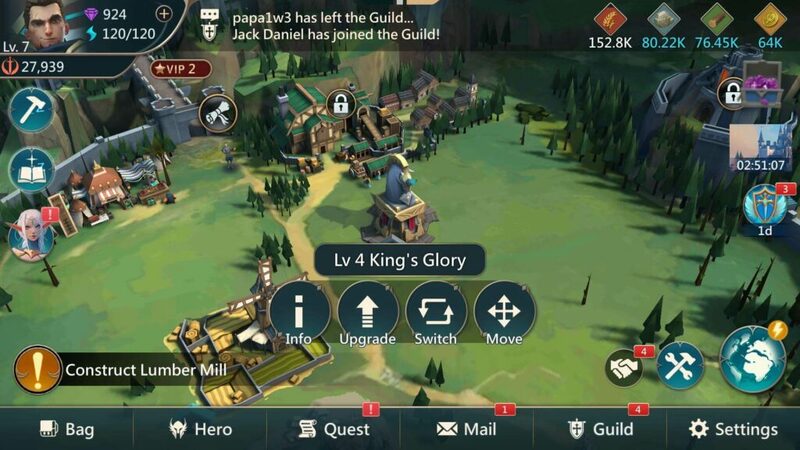 The game lets you develop and expand a mighty fantasy empire, trade resources and items with clan members, rescue cities from invaders and raiders, join a guild, get help and assist guild members to build their fantasy kingdom. The game also lets you summon a guardian dragon during combat. Might -Raises your city’s might. Check the “advised might” in a campaign stage. Although not mandatory, chances of defeat are more if your total mightislower than your opponents’ combined might. Player XP to raise player level. When you level up, you acquire talent points and might. Talent points are used to improve troop attack and defense, which will prove very helpful when you are raiding other player bases or attacking monsters on the world map.You can access talent by tapping your hero’s portrait on the upper-left corner of the screen. Energy – Needed to participate in campaign stages. Gold – used for building, research, training etc. Temporary boosts, such as food boost that increases food production by 25 percent for 24 hours. You will get this when you finish campaign chapter 1,Kingsdor. Soul stones to summon heroes.You will need a certain number of stones to unlock a hero. You can then use his/her skills during combat. Resources, such as stone, wood and food. You will receive special rewards, such as royal chests, which contain hero shards, runes and crafting items, resources/battle boosts and crystals after completing a campaign. Chests you receive are sent to your “Bag”. You will have to tap “use” to open a chest. The ticker on the lower left corner of the screen shows the current quest. Just tap the exclamation mark and you will be taken to that location or particular building. You can then complete that task to get your rewards. To know a list of quests and the rewards they offer, tap the “Quest” tab and scroll down. 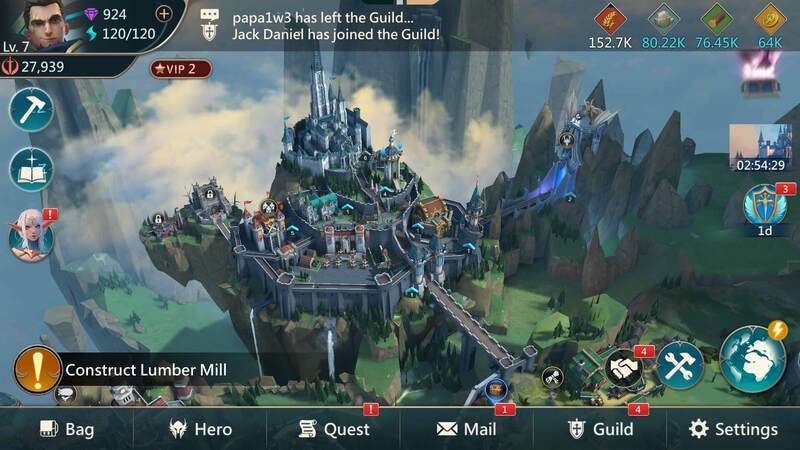 You will see quests under different categories, such as construction, research, guild activity. Tap a quest and rewards offered on completion will be displayed on the left side of the screen. You don’t have to follow the recommended quest. Just tap some of these quests and complete them. Don’t forget to claim your rewards. Mobile Royale’s campaign mode lets you fight deadly enemies to free clans from invaders and raiders. Battles are in real-time, although you will only have control over a hero’s special abilities. However, you can set up an army consisting of ranged, infantry and cavalry brigades against enemies. Setting up an army is crucial for winning a battle. You will have to select a brigade whose “type” is stronger than the enemy brigade. Infantry is stronger than ranged units. Cavalry is stronger than infantry, and ranged units are stronger versus cavalry. Keep this in mind when you select units before a battle starts. Check the enemy brigade types and then select your brigades based on their selection. If the first round of battle has two ranged brigades and one infantry brigade; you army should comprise of infantry and cavalry brigades. Another key battle strategy is to select two or more brigades of the same type to unlock battle bonuses. You will need two brigades of the same type, especially when your opponent has more than one brigade of the same type. This is needed if you want to effectively counter attack. The good news is that that by selecting 2 or more units of the same type, you unlock certain perks that will help you a lot in battle. The battle bonus unlocked will depend a lot on the brigade type. 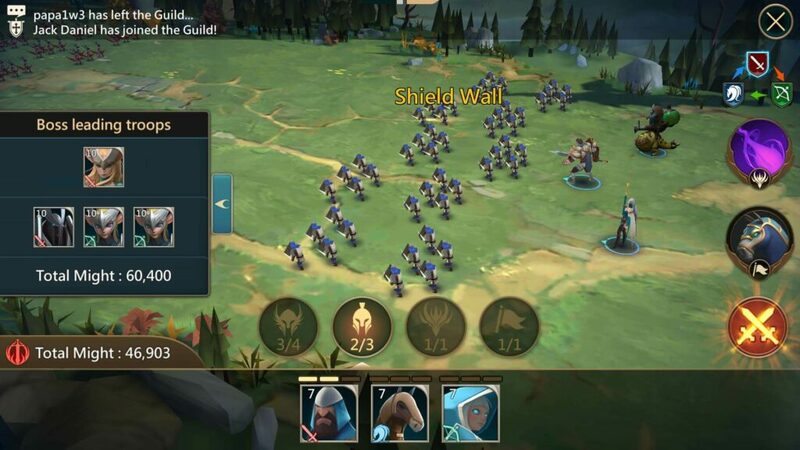 If you deploy more than one infantry brigade, you will unlock their “shield wall” bonus that increases their defense stats during combat. If you send more than one ranged brigade, you will unlock “Barrage”, which increases their attack speed. If you send two or more cavalry to battle, you will unlock “Charge” which greatly increases speed and damage for cavalry brigade, but for a shorter period of time. Choosing the right brigade type is important, but in many occasions, you will have to select two brigades of the same type and this is when these passive bonuses are activated. Clan backups can be of immense help, especially when you are losing troops during battle or when you need to strengthen your existing troops. As you already know, the campaign mode lets you protect different clans from raiders and in return they provide military backup to help you defeat enemies. 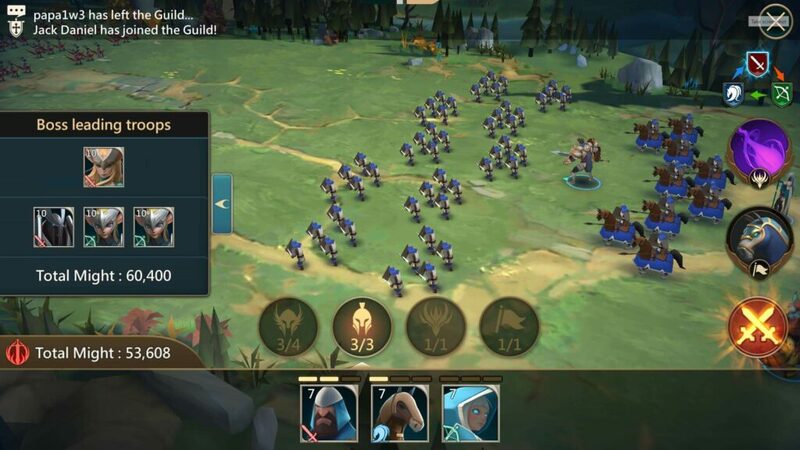 While battling, you can call for support from a clan by tapping a clan’s troop on the right side of the combat screen. To receive backup, you will have to unlock and build clan ruins in your kingdom. To build a ruin, go to the Arcane Sanctum. The sanctum is located beside the clan soul stone, a structure which gives access to campaign mode. Tap the sanctum and then tap “ruins”. Select a ruin and place it on the empty space on your kingdom to get backup armies from a clan. Complete certain campaign stages or acquire shards if you want to unlock a new ruin. For example: The “Solar Tower” ruin can be unlocked when you clear “Elite Campaign Stage 2-6” or when you acquire a certain number of solar tower shards. You will get shards as rewards when you finish a chapter 2 stage. The “Elite” mode or hard mode unlocks when you complete all normal stages of a campaign. You will have to complete all stages of chapter 2 – Sunsingers to unlock elite mode and then complete all stages until stage 6 in elite mode to unlock the Solar Tower ruin. You can then place a solar tower ruin on an empty space to unlock the Sunsinger clan’s soldiers. In the next battle, call for sunsinger troop’s support while fighting enemy. If you want backups from more than one clan, you will have to raise the ruin limit. In the beginning, the limit will be set to 1, which means you can place only one ruin on your kingdom and call backup corresponding to that ruin. 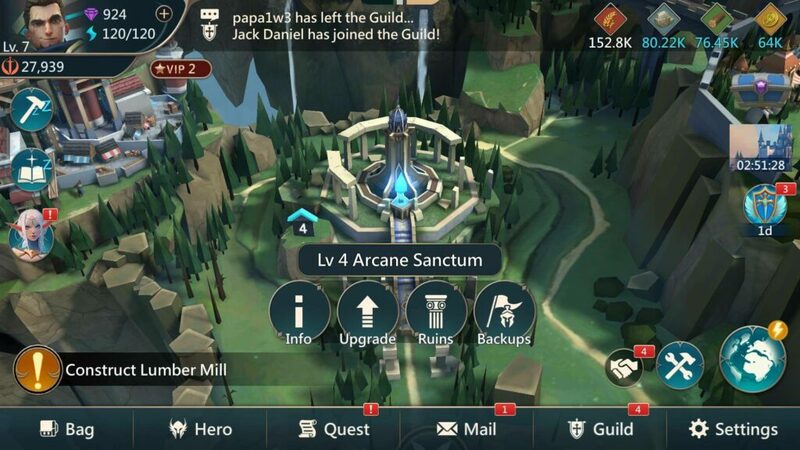 Upgrade the Arcane Sanctum to level 7 and to get clan backup benefits from two ruins. Summoning a dragon during combat is one of the most interesting gameplay features of Mobile Royale. To summon the guardian dragon during combat, select a skill by tapping the dragon icon. 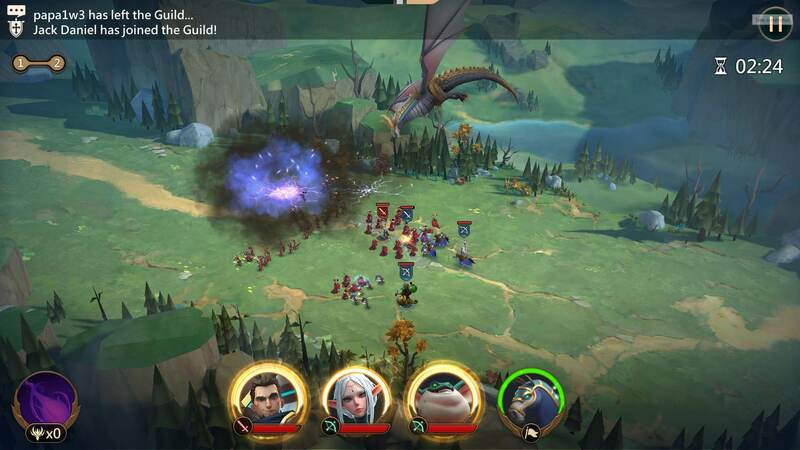 You can set up army, select dragon skill and heroes when the battle begins. Choose wisely! While fighting, tap the skill and the dragon will attack your enemies, eliminating half of the troops in no time. Primal judgement skill that deals 10% damage to enemies, with a chance to decrease the DEF of enemy infantry heroes by 10%. You will have to select this skill by tapping the dragon icon before the battle begins. Besides unlocking a skill, you will also unlock several passive skill bonuses, such as increase in research speed by 10 percent and increase in key stats of clan backups by 10 percent. Keep unlocking new stances using different types of elemshards to unlock more deadly dragon skills. Diplomacy unlocks when you complete the Kingsdor campaign chapter. Once unlocked, tap the notice board – a floating scroll icon outside the castle gates to access diplomacy requests. On the left side of the notice board, you will see a list of requests. Additional requests from other clans are unlocked when you complete their campaign chapter. To fulfill a diplomacy request, you will need a certain number of items, which can be requested from clans via Airship Dock > Trade. You can unlock this dock when you reach a certain castle level. For example: To fulfill the Kingsdor diplomacy request, you will need a certain number of “pulleys”. You can get pulleys in exchange of your castle resources via Trade at the Airship dock. 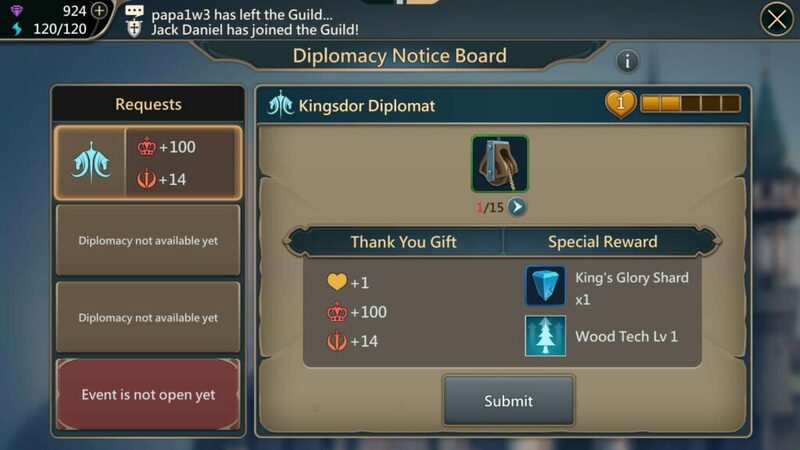 On the diplomacy page, tap the blue button below the pulley and you will be taken to the trading page where you can request this item from a clan. You may have noticed that several diplomacy items are locked. To unlock them, you will have to raise the diplomacy levels for that particular clan. So, if you want to use training weapons for diplomacy requests, you will have to reach the Kingsdor diplomacy level to 3. To do this, keep fulfilling all Kingsdor requests until the friendship bar (heart icon) fills up. When you fulfill a request, you will get a friendship point (heart). When the friendship bar fills, the Kingsdor diplomacy reaches a new level. Keep doing this until you reach level 3 and to unlock “training weapons”. Once you join a guild, it’s time to make use of your brigades to hunt special monsters on the world map. You will get a chance to earn shields boosts and speedups, although it’s not guaranteed. However, you will definitely get shards which will help you unlock monster ruins. When you place a monster ruin, you will get boost in stats such as increase in DMG to a certain monster type based on the monster ruin you have placed on your kingdom. For example, hunting the “Ifrit” (fiend monster) will let you earn Horned Alter shard, which will unlock the Fiend Ruins at the Arcane Sanctum. Now you will get damage boosts whenever you battle a fiend monster type. Tap the world map icon and scan the map for monsters. Tap a monster and then tap the “hunt” button. Now choose your army by pressing the “Quick Select” button. This will automatically choose the right brigades for your monster hunts. Tap OK. Your army will automatically march towards the monster, kill it and bring home rewards such as crafting items, resources and shards. Like most mobile massively multiplayer online strategy games, Mobile Royale also lets you join a guild to get more benefits. You should join a guild as soon as it’s available. Make sure you join an open guild and not the one that requires you to apply for joining. Your application may get rejected if you don’t meet the guild owner’s requirements. There are several benefits of joining a guild. 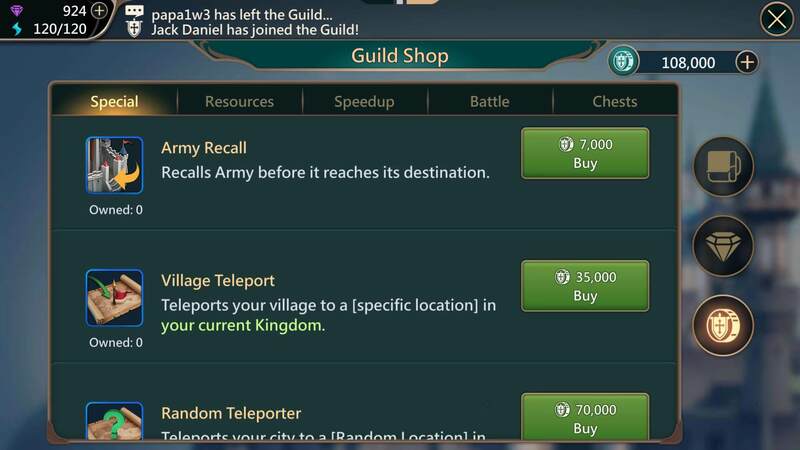 One big advantage is that you can get “guild helps” to speed up your city development. It takes time to build or upgrade a building, and by joining a guild you reduce building upgrade times by tapping the handshake icon. Your guild members will help you speed up progress. You can also help your fellow guild members by tapping the handshake icon on the lower-right corner of the screen. Tap it and then tap the “Help All” button to speed up progress of all guild members. When you do this, you get guild coins. They can be used to purchase speed-ups, resources, battle boosts and chests. The daily coin limit is 100,000. Limit resets every day, so the amount you have earned will be lost once it resets. Start using guild coins to purchase resources and items when you have earned over 50,000 coins.